These are our hand-cooked Peri-Peri chicken groove cut chips. Those of you who know us already will know that we're somewhat fanatical about Peri-Peri Chicken. 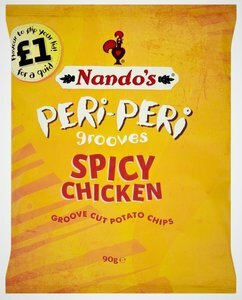 So we've sweated our Peri-socks off to create the Nando's Chicken Peri-Peri experience right here in this bag. Incredible.